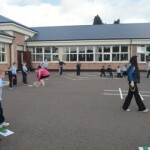 The Active School Flag is awarded to schools by the Department of Education and Skills who strive to achieve a physically educated and physically active school community. 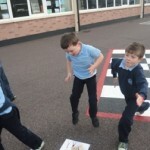 It is a whole school process and it involves implementing improvements in our school that will have a real and tangible effect on our school community. 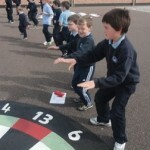 Our main aim is to improve our PE teaching and the PE experience for the children. 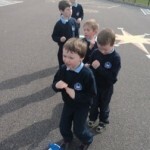 We hope that children who are not overly interested in sports will embrace some sort of physical activity. 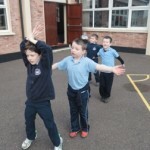 Our hope is that the children will develop a healthy lifestyle and engage in a physical activity that appeals to them. Our school was awarded the Active Flag in 2014. 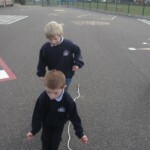 Since then our school has continued its commitment to the ASF process. 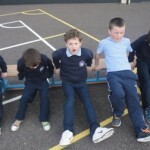 Our school motto for PE is ‘Lets do some physical education and we will save the nation’. We are currently renewing our flag this year, school year 2016-2017. 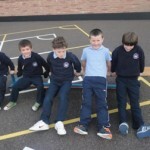 Two pupils from each classroom were elected to the Active School Flag committee. 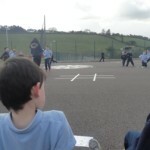 This ensures that is a balance of senior and junior pupils on the committee. 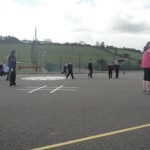 • The Active School Flag is on the agenda for planning day/staff meetings, and the AFSF committee meet during the year. 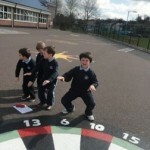 • Class assemblies are used to inform all the pupils about the process. • Parents’ Association and Board of Management are notified at meetings. 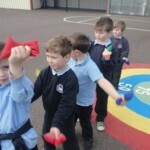 • Information about the Active School Flag is included in parental newsletters. • We have a colourful and informative Active School Flag notice board in our school hallway, which is updated regularly. 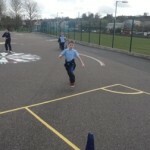 We also have a section on the school website dedicated to Active School Flag news so that the whole school community can be kept up to date with progress. 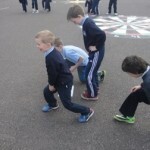 Following PE surveys which we carried out with Parents in October/November 2016, it was decided by teachers and parents that physical education would be allocated as part of homework every night. This was carried out in conjuncion with the LAYA Super Troopers initative. 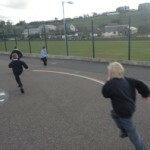 In January 2017, the pupils began training for a couch to 5k run. 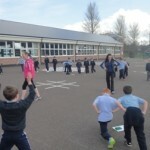 Pupils and teachers trained every Tuesday, Thursday and Friday from 2.30pm – 3.00pm in the adjoining juvenile park and surrounding track. After weeks of training the Parents Association, with the help of the teachers, organised a 5k fun run on Sunday 2nd April in Newmarket town. 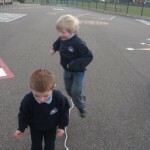 Pupils, teachers and staff of the school, parents and members of the wider Newmarket community participated in the run and it was a huge success. 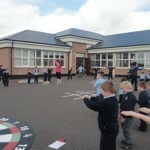 Term 3 will see the pupils travelling to our local pitch&putt course for sessions, and the pupils will also be doing gymnastics with local trainer Patsy. 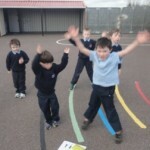 Some of the positive elements of our PE programme in Newmarket BNS! 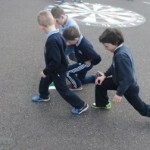 The school borrowed the Playground Markings Stencils in 2013 from the HSE and with the help of the Parents’ Association, painted a selection of playground marking in the yard, catering for all our classes and interests. 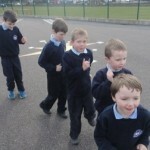 After attending a Get Ireland Active course M.Eamon has ‘Got our school walking’ every morning with a 10minute brisk walk around the park near our school. 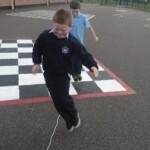 This year we are striving to achieve the Green School Travel Flag. 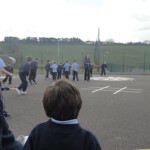 The school has Football Free Small Breaks to encourage the pupils to partake in a wider range of activities during break times. 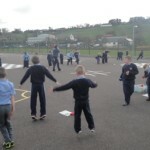 Every year high visibility jackets were distributed to the infant classes and lessons are taught on road safety when entering and leaving the school. 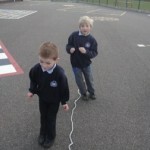 The boys are encouraged to wear these jackets when walking or cycling. 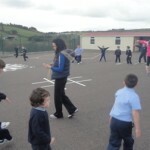 Bike Safety sessions were held with fifth and sixth class pupils in 2016 with Angela, our Green School liasion officer. We participated in the ’10 @ 10′ Operation Transformation inititaive on Friday 10th February 2017. 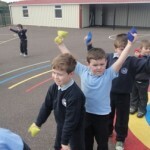 An Active Week is organised every year in our school. 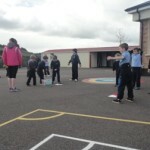 This year it is tkaing place from April 24th – 28th which will involve the children participating and enjoying a variety of sporting activities. Timetable for our active week will be put up on website over the coming days (when activities have been finalised) and will be on display on our school’s ASF noticeboard. 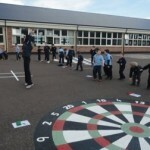 Sports Day is held in June, where pupils, teachers and parents alike compete! 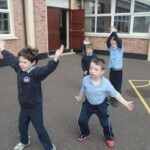 On rainy days, the teachers will make use of GoNoodle in their classroom to ensure the pupils get some form of exercise that day. 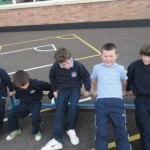 Please see photographs of our PE activities in gallery section.